This 2.25qt. 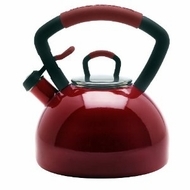 teakettle features a comfortable grip handle. The handle is that is gently arched for a wide grip. The whistle is loud and clear to alert you when water comes to a boil and has a removable lid for easy cleaning and filling. A thick, color coordinating comfortable grip handle is gently arched for a wide grip. A convenient push-and-pour spout lever makes for one-handed operation. Richly colored porcelain enamel is easy to clean and adds a splash of color to your kitchen. A Name You Can Trust Like all KitchenAid products, this teakettle is designed with you and your home in mind. Guaranteed to live up to the highest quality and exact standards you have come to know and depend on. The whistle is strong and loud to promptly alert you when liquids have reached a rapid boil.